Wahama junior Alexis Mick (31) hits a ball over the net during Game 1 of Wednesday night’s TVC Hocking volleyball contest against Miller at Gary Clark Court in Mason, W.Va.
MASON, W.Va. — Caught facing a double-edged sword. 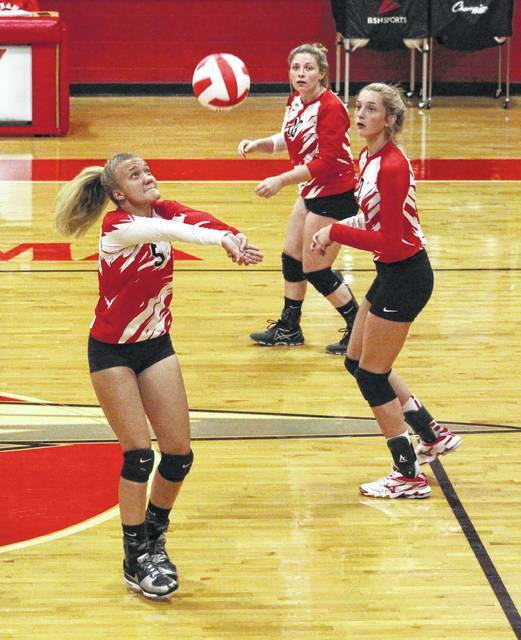 The Wahama volleyball team came away with a lot of positives, but it might have also let one slip away on Wednesday night following a 25-15, 26-24, 25-22 setback to visiting Miller in a Tri-Valley Conference Hocking Division match at Gary Clark Court in Mason County. 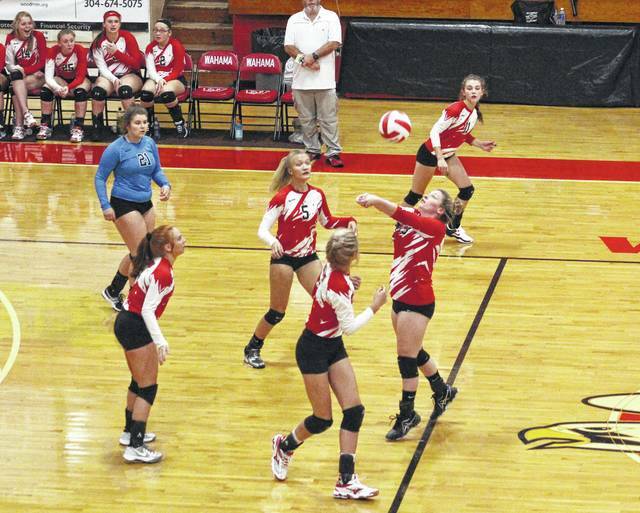 The host Lady Falcons (2-7, 1-7 TVC Hocking) dropped their fifth consecutive decision — all league tilts — against a much more proven opponent in the other Lady Falcons (8-3, 6-2). WHS, however, let a handful of golden opportunities slip away in each game, which ultimately opened the door for the Purple and White to roll on to a straight-game decision. MHS never trailed in the opening game as the guests broke away from a two-all tie by gradually building a 14-10 cushion. Following a Wahama serve into the net, Miller answered with 10 of the next 15 points while leading by as much as 22-1 before claiming the 10-point victory. Game 2 proved to be a bit more competitive as both teams battled through nine ties and 10 lead changes, and neither squad led by more than five points at any time in the middle contest. Miller led by as much as 9-6 early on, but the Red and White countered with eight straight points for a 14-9 advantage. After trading leads and points, WHS found itself in a great position after building a 24-19 edge — but another serve into the net gave MHS the serve facing a four-point deficit and no room for error. The Purple and White reeled off six consecutive points to rally back and claim the minimal two-point win while also taking a 2-0 match advantage. Wahama jumped out to early leads of 6-3 and 8-5 in the finale, but Miller answered with 9-4 charge to secure a 14-12 lead that would never be relinquished. MHS led by as much as six points at 19-13, but WHS closed back to within a single point at 22-21. The guests — who knocked off Eastern in five games for the first time since the turn of the millennium just 24 hours earlier — ended the match by scoring three of the final four points while claiming a straight-game sweep. On one hand, Wahama coach Matt VanMeter was thrilled that his troops stayed within 15 points of MHS over the course of three games. On the other hand, the venerable mentor couldn’t help but wonder what might have been if a handful of plays had different outcomes. “If you take away our missed serves alone, we could have won those last two sets. Between that and some of the silly mistakes, it could have been an entirely different outcome,” VanMeter said. “We made some adjustments and made things very interesting against a pretty good Miller team, which they proved to be last night. MaKinley Bumgarner led the Wahama service attack with 11 points, followed by Hannah Billups with seven points and Harley Roush with six points. Madison VanMeter was next with five points, while Gracie VanMeter and Elizabeth Mullins added a service point apiece. Madison VanMeter led the net attack with four kills, followed by Billups and Mullins with two kills each. Bumgarner, Gracie VanMeter, Alexis Mick and Emma Gibbs also had a kill apiece, with Gibbs also chipping in a team-high two blocks. Lacey Alexander led Miller with 17 service points, followed by Olivia Houck and Ryleigh Newman with nine and eight points respectively. Newman and Josie Crabtree led the MHS net attack with 10 kills apiece, with Houck chipping in seven kills and four blocks. Haille Johnson also had four kills and five blocks in the triumph. Josie Perani dished out a game-high 25 assists and Alexander came away with 12 digs. Miller has now won six consecutive matches. 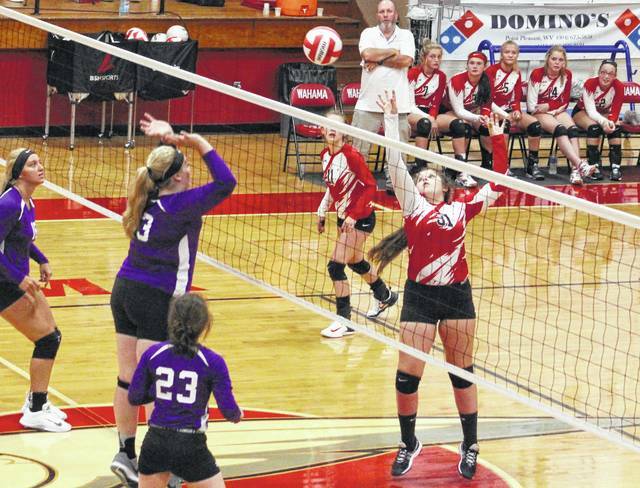 Wahama returns to action Saturday when it travels to Ravenswood for a non-conference match starting at noon.